What’s up Colts Nation? 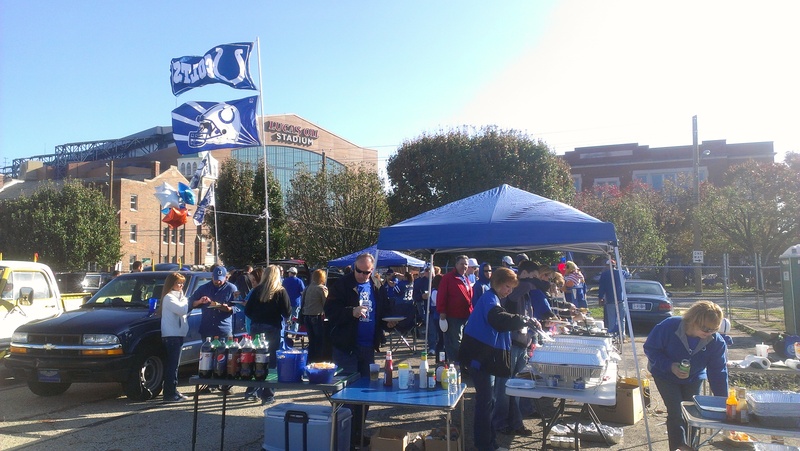 As you may know, before each home game at Lucas Oil Stadium I search the surrounding parking lots in search of the best tailgate around. This week prior to the Browns game was no different. I had my man “Top Bird” hit me up on Twitter telling me about an annual tailgate called the “Swinging Chicken Beer Bong Extravaganza.” With a name like that, I had NO idea what to expect, but man did they show up big time! The second stop of the day was south of Lucas Oil Stadium where a bunch of fans come together to make one big tailgate. I met up with two young guys from Columbus, Indiana who may be new to the tailgate world, but they are up-and-comers. Want to see the spread, the music, and the all-out COLTSNESS!? There’s only one way to find out who won this week’s tailgate battle and that’s by watching the video right here! One again, this would not be possible without the support of Colts Grille, Honda Generators/Reynolds Farm Equipment, and Hoosier Momma Bloody Mary Mix. Don’t forget to check out my homepage to learn more about the Tailgate of the year contest and what else I’m up to!